At 1 Thessalonians 5:16, Saint Paul writes a short, punchy verse: “Rejoice always” (or “Rejoice evermore”). But at John 11:35 we read that, invited to come to the tomb of his friend Lazarus, “Jesus wept.” When Paul wrote to the Thessalonians that they should rejoice always, was he forgetting that Jesus wept? To rejoice is to praise God, which goes deeper than thanking God for things he has done. Think, for instance, of the traditional Christian hymn of praise, based on the song the angels were singing when they appeared to the shepherds at the first Christmas: Glory be to God on high . . . We praise thee, we bless thee, we worship thee, we glorify thee, we give thanks to thee for thy great glory, O Lord God, heavenly king, God the Father almighty. Not a word there of thanks for what God has done: praise begins simply with the being of God, thy great glory. To “rejoice always” is to have the on-going recollection: I am not God. Thou, Lord, art God; I praise thee. Praise is my business; praise is what a creature does. And as a creature endowed with will, I will, I choose, to praise thee. But what about “Jesus wept”? Do we praise God for death, for cancer, for wars, for evil in all its forms? This is a hard topic about which much could be said, but the short answer is No: we never have to praise God for bad things. We never have to pretend to God that bad things are really good things in disguise. Yet bad things may have the effect of reminding us of our creatureliness. A small example: a pain in your foot not only tells you that you aren’t as young as you used to be, but is (can be!) a token of recollection that this lump of flesh is mortal, is created. Although we do not praise God for the pain in our foot, nonetheless the pain in the foot can be a reminder to praise God as the creator and author and source of all things. Come with me deeper. Each of us knows that God loves us quite apart from anything we have done. God’s love for us is unconditional, which is to say that, precisely, there are no conditions. With appropriate symmetry, the praise appropriate for a creature to give its creator has no conditions. We don’t praise God because we first have seen the reasons for everything that happens; we don’t praise him because things are going swimmingly in our life. No: we praise him because we are creatures. In the end it is clear: God made us for communion with him in joy, which is to praise him. These are good words from Saint Paul as we come close to Christmas: rejoice always. Out & About. On Sunday, December 31, I am to preach at the contemporary uptown services, 9 and 11:15 a.m., at Church of the Incarnation, Dallas. Starting Saturday, January 20, and meeting once a month through May, I am to teach the Christian ethics course at the Stanton Center. 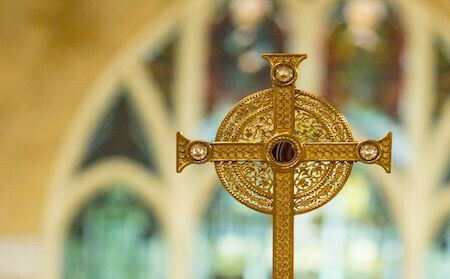 The classes are on the third Saturday of each month from 1 to 4 p.m. at St. Matthew’s Cathedral, Dallas. Anyone can attend, either as auditor or for credit: see http://www.episcopalcathedral.org/stanton-center/. Christian ethics is a vast subject that brings to a point what we believe about God and about God’s creation, especially human beings. It’s never dull, and I hope you’ll consider joining this class. Finally, this is my last post of the year. I’m grateful to Kimberly Durnan at the diocesan office for her help and encouragement with the mechanics of this blog. And I am grateful for my readers. As Dickens put it on the lips of Tiny Tim: God bless us, every one.